Original Gospel | Examining Bible Truth from the Scriptures alone. Many articles have been written concerning the prophecies of Messiah. However, there are some hidden gems which are often overlooked or misinterpreted. It is these gems that we wish to consider. In the very first book which Moses penned under God’s inspiration – Genesis, we find the first promise of a saviour. The promise was given right after the very first sin, when Adam and Eve ate the forbidden fruit, disobeying the only command God had given them. God had clearly told them, “but of the tree of the knowledge of good and evil you shall not eat, for in the day that you eat of it you shall surely die.” (Genesis 2:17) Adam and Eve ate of the tree and became sinners deserving death in the brand new world. However, once our Heavenly Father had received their confession of sin, he gave the promise of a saviour to come, even before telling them the consequences of their sin! God’s mercy comes before His judgement! Why would the first promise be directed to the serpent? Enmity means “hostility, by implication a reason for opposition: – enmity, hatred.” At first read this sounds like God is saying that women and snakes would hate one another. While this may generally be true, is it only true for women and snakes? And why would God put hatred between baby snakes and the children of women… not men? Surely, this has much deeper implications… hidden gems! Let’s begin our investigation by determining what the serpent symbolizes in Scripture. To understand what the snake symbolizes, it is helpful to consider the serpent’s role in the first sin. The serpent began his appeal to Eve, putting forth the idea that God had said none of the trees of the garden were to be eaten. This was not true. God had provided all the trees for food, except one. The serpent wanted to make God seem unfair. Then the serpent told a lie, “You will not surely die,” to insinuate that God was a liar. He added ‘top-secret’ information saying, “For God knows that when you eat of it your eyes will be opened, and you will be like God, knowing good and evil.” Having painted God as an unfair, lying tyrant, now the serpent caused Eve to believe that God was hiding wonderful opportunities from her, and question whether God truly wanted what was best for His creation? Through his cunning words, the serpent deceived the first woman to doubt God’s love, sincerity and wisdom, and make a wrong choice. “So when the woman saw that the tree was good for food, and that it was a delight to the eyes, and that the tree was to be desired to make one wise,” she chose to disobey God and ate the fruit. We are told in 1 John 2, that these same promptings that led to the first sin, are also promptings we receive from ‘the world’, “the desires of the flesh and the desires of the eyes and pride of life—is not from the Father but is from the world.” Any one who has ever faced temptation, (all of us!) knows that these are the very promptings which lead us to sin. And generally, when we sin, the same doubts lead us to dismiss God’s commands. Who or What Was the Serpent? Genesis refers to the serpent as ‘a beast of the field’ (Genesis 3:1). Therefore the serpent was part of God’s creation. Yet, he was “more subtil than any beast of the field which the Lord God had made.” ‘Subtil’ means ‘shrewd, crafty, sly, sensible, prudent’. It is translated in the Old Testament as ‘prudent’ – a good quality – more often than anything else (ie. Proverbs 13:16;14:8). ‘Subtil’ doesn’t necessarily imply the serpent was evil, just an animal with higher than average intelligence, and the ability to speak… but still an animal. It is possible that the serpent may have seen the angels eating fruit from the Tree of Knowledge of Good and Evil, and based his faulty assumptions upon what he saw. What Does the Serpent Represent in Scripture? The World and the Carnal Mind are at Enmity with God! Since the fall of our first parents, we don’t require a serpent to create doubt in our minds towards God and His commands. Our human nature (carnal mind, flesh) is constantly prompting us with plenty of questions and doubts. Is then the serpent representative of the deceitful opposition of our natural minds, and those who choose not to be restrained by Divine influence? Who or What is the Serpent’s Offspring Today? These religious leaders were singled out as being ‘the serpent’s offspring’, and children of the devil – based on lies that lead to death. Throughout mankind’s history, many have followed the same course… and not always with a religious veneer. Who is the Woman’s Seed? The Old Testament tells us that Immanuel, or Messiah would be born of a virgin. “Behold, the virgin shall conceive and bear a son, and shall call his name Immanuel.” Isaiah 7:14. There is no reference here to a human father…only a mother… a virgin mother. The Messiah would be the woman’s seed in a special way that is true for no other human being. 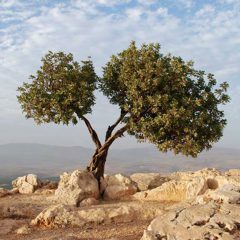 Was Jesus Christ the Woman’s Seed? “But when the fullness of time had come, God sent forth his Son, born of woman, born under the law,” Galatians 4:4. Jesus Christ was conceived when God’s Holy Spirit power miraculously caused an egg in Mary’s womb to become a child without the involvement of a human father. (Luke 1:30-38) Many times in the Old Testament, barren women had miraculously given birth to ‘promised’ children, but this was the first time that God used only a woman to conceive a promised child. Jesus Christ literally fulfils this unusual detail of the prophecy. There is however, a spiritual application, in which all those who try to follow God’s commands are ‘in Christ’ and therefore part of the ‘woman’s seed’ (Revelation 12:17). If Jesus is the literal woman’s seed, then the woman is literally Mary. However, spiritually ‘a woman’ in Scripture often symbolizes the ‘bride of Christ’, or God’s betrothed, the body of believers, or when true followers go astray – an unfaithful harlot (Revelation 19:7-8; Hosea 2:16-20; 2 Corinthians 11:1-3; Revelation 17). There will always be opposition/hatred between those who want to follow God’s commands, and those who choose to be governed only by the carnal mind (John 15:18-29; 17:14-16; Romans 8:5-8). There will always be opposition within our own minds between the ‘mind of the spirit’ and the ‘mind of the flesh’ (Romans 7:15-25). In the Genesis 3:15 prophecy, the serpent was to bruise the woman’s seed on the heel, but the woman’s seed would bruise the serpent on the head. One is a fatal blow, the other a wound. Much has been made of the blow to the heel. Many Christians would see this promise being fulfilled when Jesus was crucified by sinners (the seed of the serpent), because it was only a temporary wound, since he was raised to eternal life three days later. But, how did Jesus deliver a fatal blow to the serpent? This is not so clearly expounded. The Serpent in the Wilderness? When did Moses Lift up a Serpent in the Wilderness? If you look up Numbers 21, you will read of the incident in the wilderness when the people of Israel were complaining against God and Moses and despising the daily, miraculous provision of manna. God sent poisonous snakes which bit the people and many died. Then, when the people begged for mercy and salvation, God directed Moses to build a bronze statue of a snake and put it on a pole. Those who looked at it were saved from death. Why did God direct Moses to a make an image – something against his commands in Deuteronomy 5:8? Did He want people to ponder this incident very carefully? Why does Jesus compare his crucifixion to a bronze statue of a serpent on a pole? In what way does this incident in Number 21, symbolize the sufferings of Jesus? Serpent on the Pole = Jesus on the Cross? If the serpent represents human nature, then this Hebrews passage fits perfectly with Genesis 3:15. Hebrews 2 tells us that Jesus partook of ‘flesh’- which is the same word ‘sarx’ referring to the carnal mind, and human nature (Romans 7:18; 8:3,6-7). Jesus crucified this human nature on the cross… he put it to death literally! Throughout his life, Jesus refused to give in to the thinking of the flesh (the voice of the serpent), and the inclination to doubt God, and to serve himself rather than his Father in heaven. On the cross he refused the strongest human inclination of all – the desire to preserve life and escape brutality. Jesus submitted to God’s law – and His will for his Son’s life, even though in the Garden of Gethsemane Jesus struggled in prayer to resign himself to the torture that lay ahead (Luke 22:39-46). So in his life, Jesus was continuously victorious over the voice of the serpent. In his death, Jesus completely destroyed the devil within (the carnal mind, the serpent). The voice of temptation would never speak to his mind again. Even though Jesus died on the cross, it was only a temporary blow to the heel, as he was raised to eternal life three days later. Not only did Jesus completely defeat the serpent within, but as it says in the Hebrews 2 passage above, Jesus also provided the way of escape for all of mankind, from the ‘lifelong slavery’ to our sinful nature, and the ‘fear of death’. And we are so thankful! In our next blog, we will consider the second promise of a saviour, made to Abraham in Genesis 12.